4.5" closed. 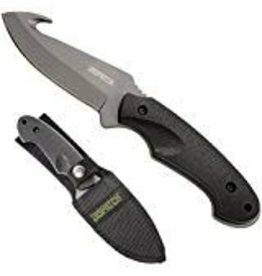 3.5" gray titanium coated stainless guthook blade. Black textured rubber handle. Extended tang. Thumb stud. Lanyard hole. Black nylon belt sheath. Boxed. Made in China.